How did that film stack up against others released that year? Well in Ted Sennett’s Hollywood’s Golden Year 1939 A Fiftieth Anniversary Celebration, it didn’t make the main chapter list which consisted of Gunga Din, Stagecoach, Love Affair, Midnight, Wuthering Heights, Dark Victory, Only Angels Have Wing, Goodbye Mr. Chips, Young Mr. Lincoln, The Old Maid, The Wizard of OZ, The Women, Babes in Arms, Mr. Smith Goes to Washington, Ninotchka, Destry Rides Again and Gone with the Wind. It didn’t make the “other” notable movies list. It did make the “still other” notable movie list. So, third tier if you will. It’s hard to say what makes this film my favorite. Perhaps things that have happened or are going on in one’s life at the point of having seen the film endear it. Don’t worry folks, I was not flogged on the pillory, but when my father was chasing me around the dining room table with a belt, I would run to my mother yelling Sanctuary! Sanctuary! She would say just don’t hit him in the face..jeez even Quasimodo didn’t get it in the face. Some factoids about the film. Orson Wells was offered the role of Quasimodo but would only accept if he could direct the movie as well. However William Dieterle was already contracted to direct the film. 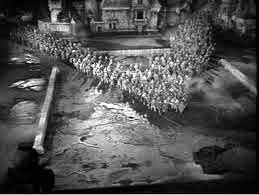 He did a masterful job on the film, particularly directing the crowd scenes, which is an integral part of the movie. The recent movie V for Vendetta borrows from one of these scenes (right). It was RKO’s most expensive production, clearly trying to outdo Universal’s Lon Chaney version of 1923. The story takes place in 15th century Paris. I will interject here that the sets were fantastic and the re-creation of the Notre Dame Cathedral magnificent. So Quasimodo, (from now on referred to as Q) which literally means half formed In his own words “I’m not a man, not a beast I’m as unformed as the man in the moon” is the deaf malformed bell ringer of Notre Dame. We feel sorry for him, but folks I’m no expert on job availability in 15th century Paris, but hey, bell ringer of Notre Dame, me thinks great work if you can get it. Room and board, 3 squares a day and a great view of Paris. All kidding aside, the film marks the American screen debut of Maureen O’Hara. Laughton had worked with her before in Hitchcock's Jamaica Inn, and wanted her for the role of Esmeralda. Interesting sidebar 1939 also was the year Hitchcock relocated to America. Any way, Esmeralda danced into our hearts and into every actor’s heart with a Y chromosome in the film. This unfortunately included the evil Frollo who becomes totally deranged. Frollo took in Q as a ward when he was a baby left on the steps of Notre Dame. A mere look of disdain from Frollo sends Q cowering. After Q’s arrest, having failed to capture and return Esmeralda to the church at Frollos behest, Q is sentenced to be flogged on the pillory and then left to bake in the sun for an hour. As Q begs for water, Frollo passes him on horseback and gives him one of those looks, which in this instance says not only did you fail to bring the girl back but you’re an embarrassment to me and the church.This scene heightened my dislike for Frollo. As things progress Frollo can’t let Esmeralda fall in love with Phebus so he kills him, blames it on her, tries and tortures her into confession. My dislike for Frollo has now been elevated into hate. Sidebar, in the 1923 version Frollo is the Archdeacon, his evil brother is named Jehan and Phebus is not killed. But it is Laughton’s tour de force performance, especially in the touching scenes with O’Hara which makes this film unforgettable. Laughton himself was perhaps not the handsomest leading man in movies and there was speculation that his performance was inspired by some of his thoughts about himself. When he and make-up artist Perc Westmore finally agreed on what the hunchback would look like, His facial movements were limited to the movement of his left eye and mouth. It is simply amazing to watch the depth of emotion Laughton is able to express with that left eye. No more so than in the water scene. The nuance and subtleties in this scene are incredible. Q initially throws his head back rejecting the water from Esmeralda, but in need reluctantly accepts it. Then after staring at her, and being taken by her beauty and kindness, stretches his body and head in a different direction and actually appears to revel in her giving him the water. Take a close look at this magnificent scene, no pun intended, perhaps one of the greatest scenes in cinematic history (Below). We see as the movie progresses that Q is an intelligent and sensitive being. He hides half of his face when he gives Esmeralda the bird as if to say maybe you could love the beautiful person trapped inside this hideous body and in the final scene as he watches Esmeralda and Gringoire (Edmond O’briens screen debut) depart, rests against a gargoyle and utters the classic line ”why was I not made of stone like thee” . Oh by the way before that happened he tossed Frollo off the bell tower. Yessss! If there was an award for best male performer in a classic film Laughton takes it hands down. Overall the film satisfies on many levels, the triumph of good over evil, of enlightenment over medievalism, of kindness over cruelty. 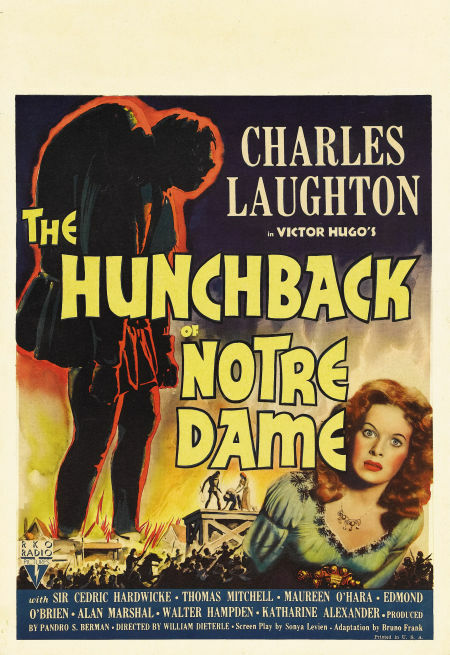 As to collectibles, as alluded to above, effort was made to keep the hunchback's face a surprise for audiences. So the advertising material did not show Q's face. The window card (below) is typical of this effort. 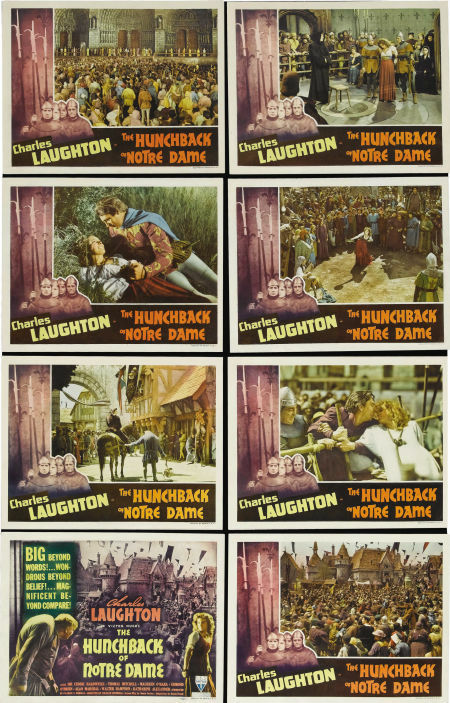 The lobby card set other than perhaps the title card is uninspired. However the 1952 re-issue lobby set is somewhat better. I've taken the borders out of the pictures so you can see some of the better scenes that were chosen for that set. The Italian rendition by Ballester is fairly rare and very collectible. However Q's face is made to appear demonic in that rendition (below). The laser disc album cover, in keeping with tradition, shows us the left side of Q’s face (Below). The designer must have taken a tip from Claudette Colberts photographers. There is in addition a set of jumbo ? portrait lobby cards that I could not find pictures of. However this set was sold at the Cinevent auction some years ago. If anybody reading this article has that set or knows where there are pictures of it, I would love to see them. Speaking of Cinevent, and thinking about RKO, in Oct 2010 Scott Burns had mentioned the passing of Charles Van Fossan. A staple in the Cinevent, http://cinevent.com main dealers room. With a background in theater management and film advertising, he was obviously a talented wood worker as well. He produced small wood standees, magnets and 3D lobby cards for sale. I purchased a number of pieces from him over the years. Since my mind was on RKO when I wrote this article, I remember him doing wood carvings of the major studio logos. I wish I had purchased the whole set but I only purchased the RKO piece (Right). Anybody who regularly attends Cinevent will notice his absence. My North by Northwest refrigerator magnets (Below) are so much better than my tax preparers calendar magnet. I like this stuff though my wife put her foot down when I started putting up those movie poster switch plates. 1939 was light on horror films, my favorite genre, it did however give us Tower of London and Son of Frankenstein. 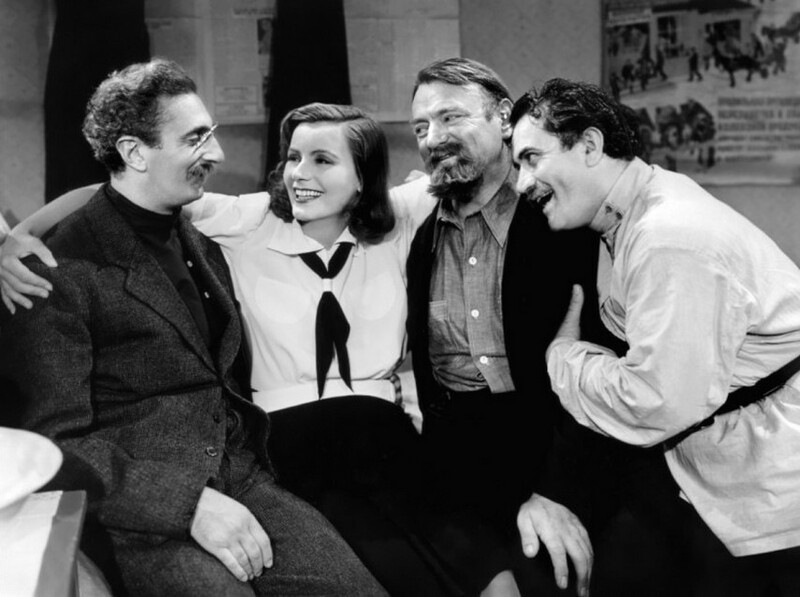 My second favorite 1939 film was Ninotchka. I will simply say it was wonderful seeing Garbo in a comedic role and hey a little bit of Bela to boot (click).